A heartfelt thank you to all our supporters and event attendees during 2016. To help kick things off for the new year, we will be welcoming our special friend Micheal de Groot to guest host the show. 13:30-14:00 Introduction & Welcome: Delegates will be given a one minute slot to make an impression, and introduce themselves to the group. 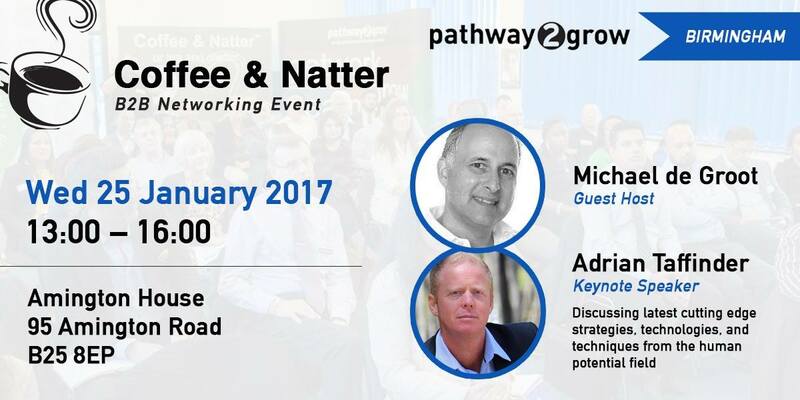 Pathway2Grow’s Coffee and Natter events enable like-minded entrepreneurs to network in a friendly, professional, and ‘no pressure’ environment. Each event is centred around a credible guest speaker, who share their expertise in a certain area of business. 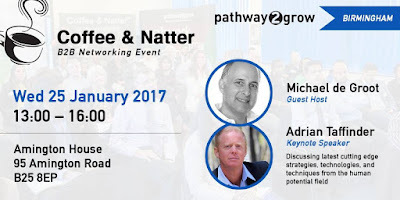 The presentations provide value to those who are looking for self-development, as well as personal and business growth- regardless of their industry. Although we encourage members to take part in the ‘introduction slot’ and make the most of this networking opportunity, it is not a requirement to actively get involved. Whether you are looking to initiate professional relationships, or simply want to learn from our experienced guest speakers; our events will meet your personal requirements and networking preferences. Or ask about our monthly meet ups.